You’ve probably felt the need for a good selection of toddler tights if your little girl likes wearing dresses and you live somewhere that isn’t summer all year round. They keep her little legs and feet warm no matter how cold it is outside, and let her play as wildly as she likes without having to worry about her nether regions being exposed. Fun tights; with stripes, bright colors, and fun patterns, to wear under more solid colored playdresses. 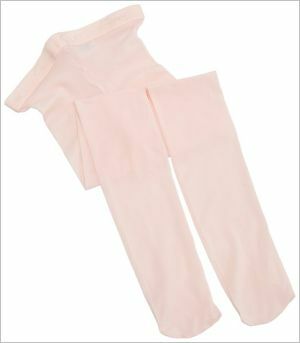 The best formal tights for toddlers are Capezio Little Girl’s Hold and Stretch Tights. These quality tights are 88 % nylon, 12 % spandex, and they’re semi-opaque. They come in ballet pink, black, or three different shades of brown. They’re more durable and thicker than many other nylon tights, and they advertise themselves as run-proof, if such a thing exists. You won’t want to put your little girl in these for long stretches of time , but they’re perfect for dance class, weddings, or wearing to church under that pretty dress. For solid-color tights to wear every day, Jeffries Socks Little Girls’ Seamless Organic Cotton Tights are a good option. These tights are 82% organic cotton; the remaining 18% is a nylon/spandex blend. They come in fourteen color choices, so you get to choose a selection that will best fit your little girl’s wardrobe. They’re comfy, they stay nice, they’re easy to wash and they keep little legs warm. 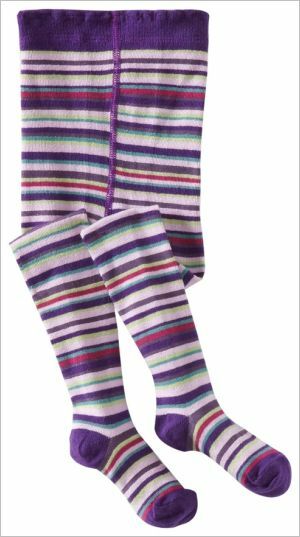 If you want something really, really comfy and warm, though, try something else:Jefferies Socks Little Girls’ Fuzzy Stripe Tight. These striped tights make your little girl feel like a soft teddy bear, and there’s no way she can get cold when wearing these—unless you leave her out on a street corner in the middle of winter in Siberia. They come in four different colors: purple, pink and blue stripes, pink, red and white stripes, black, gray and white stripes, and stormy blue and green stripes. All the color combinations are adorable, and nothing will look as cute as your little girl’s feet kicking around in these! A thinner but still substantial pair of striped tights is Country Kids Little Girls’ Jelly Bean Stripe Tights: a fun pair of tights in pink and rainbow jellybean colors. These tights are 70 % organic cotton, 27% nylon and 3% spandex. They wash well, are comfortable, and are decidedly cute as well. Many parents report that the sizing is a bit large; so you may want to buy a smaller-than-usual size for your toddler to get something that fits. Four pairs of toddler tights for four different types of occasions. However many tights you buy, though, make sure you don’t keep your daughter in them always, and she should never sleep in them. Wonderful as they are for keeping legs warm, they are not so wonderful for circulation and should be used thoughtfully.